The Ames Laboratory at Iowa State University hosted a magnetic refrigeration conference that drew an international audience in Des Moines Iowa on May 12, 2009. The focus of the four-day event was on an energy efficient form of refrigeration that replaces gas compressors and ozone-depleting refrigerants with a system that uses special alloys and a magnetic field to provide the cooling and environmentally benign coolants to circulate that cooling power through the refrigeration loop. A magnetic refrigeration system works by applying a magnetic field to a magnetic material – some of the most promising being metallic alloys – causing it to heat up. This excess heat is removed from the system by water, cooling the material back down to its original temperature. When the magnetic field is removed the material cools down even further. This is the cooling property that researchers hope to harness for a wide variety of cooling applications. 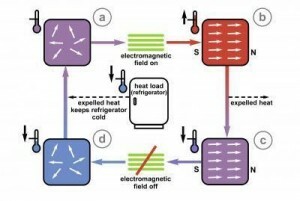 Magnetic Refrigeration Process Graph. Click image for more info. The first operational laboratory prototype magnetic refrigerator will be on display. It was built by Astronautics Corporation of America, Milwaukee, Wis., with assistance from Ames Laboratory scientists who worked on the magnetic refrigerant materials. Refrigeration and air conditioning units pose a major load to the planet’s energy consumption – in the U.S. in the summer months they account for approximately 50 percent of the country’s energy use. Then on May 15th Dr James Moore and Professor Lesley Cohen, from Imperial Collage London, Department of Physics, paper was published in Advanced Materials. The new study shows that the pattern of crystals inside different alloys – otherwise known as their microstructure – has a direct effect on how well they could perform at the heart of a magnetic refrigerator system. The Imperial College London says this could, in the future, help them to custom-design the best material for the job. This new research follows another study published by the same Imperial group in Physical Review B last month, in which they used similar probing techniques to precisely measure the temperature changes that occur when different materials are removed from a magnetic field, and to analyze the different ways they occur. The lead scientist Kelly Morrison found that at the molecular level two different temperature change processes, known as first- and second- order changes, happen simultaneously in each material. The team thinks that the extent to which each of these two processes behave in a material also affects its cooling capabilities. The research was carried out in collaboration with the Ames Laboratory at Iowa State University. Improving refrigeration by about 25% would be a significant improvement. With threats to living comfortably, storing foods and other important task threatened by cap and trade costs, 25% might get consumers back closer to something affordable. Most of America is air-conditioned some or a lot of the year. Refrigeration is a continuous job. These two energy driven jobs deserve intense attention and this work might be just what is needed. The article does not mention that this technology obviously would serve well as a heat pump, thus cutting energy demands for home heating in moderate climates. hello, I am a student at Jomo Kenyatta University of Agriculture and Technology (KENYA) taking a Bsc. in Mechanical Engineering, a fourth year student, and just so much enthusiastic about this technology that I am contemplating to take it as my final year project. The technology could be applicable as a heat pump, refrigeration and in air conditioning. But I wonder why since 1930s the idea has not been commercialised, could there be a huge draw back behind the scene? So i want to know this next year when the university will be financing for projects (a set up must be made next year for analysis). In the mean time how could you support a young upcoming engineer to see the success of the whole thing? Thanks in advance. Thuo… don´t waste your time on this technology… rather find a good gas compressor supplier like Danfoss, Embraco, etc… they will not disappoint you and make false claims. Hope to get a terrific idea for your project! Looks like there’s a bit more work to be done yet. Thanks for learning me and updating me about the progress on magnectic refrigeration. I need to read more articles on this website! This information here is genius.